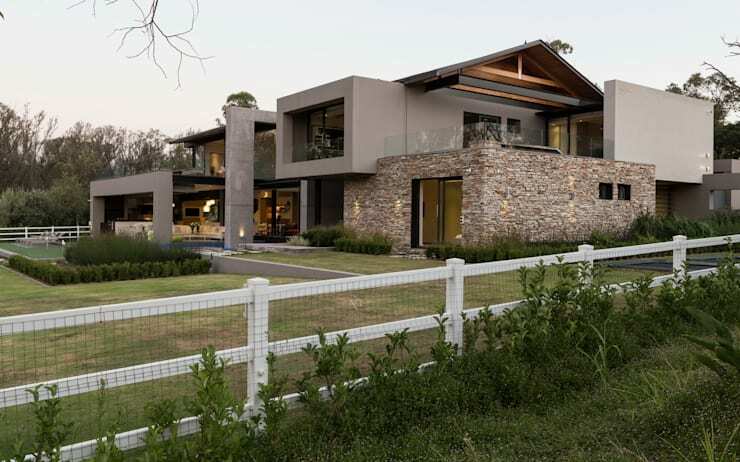 When it comes to South African architecture, we have seen many prestigious projects located in Gauteng Province, and it seems that this is the place to be when it comes to good design and architectural innovation. Today we will look at another magnificent offering from this part of our beautiful country, and one which takes full advantage of its location in the area. 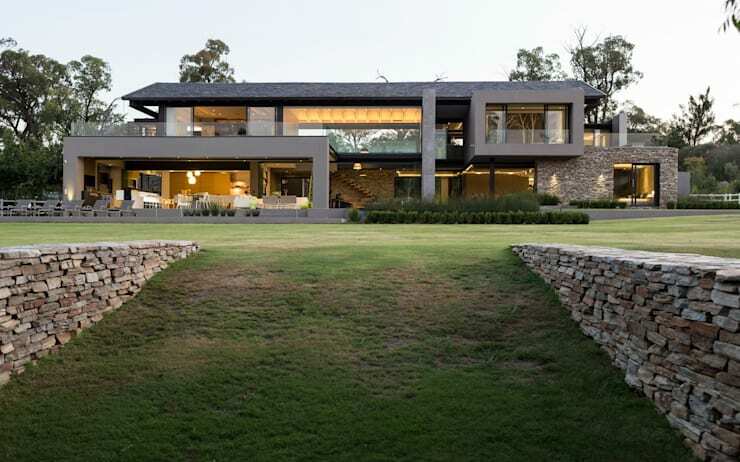 The House Blair Atholl is the latest project we present to you from the renowned South African architects, Meulen Architecture. This specific building had been designed by Werner van der Meulen, and the structure boasts of an impressive surface area of almost 750 square meters under one roof. The expansiveness of this house cannot be missed by anyone who sees it, and certainly creates a dignified first impression. The brief for the project commissioned a home that had to be contemporary and practical, with an emphasis on outdoor living, and especially on entertaining. The architects state that this was a simple form-follows-function approach, the manifesto of modernism. The key characteristic of this home is that it had been designed to be free from boundary walls and high electric fencing. This is uncharacteristic of most luxury houses in the area, which usually have ostentatious privacy and security measures. This house, however, had been designed to fully enjoy unrestricted views of the beautiful surrounding countryside. Here we can see modest, low-rise, white picket fencing, modified only by wire in order for pets to remain within the limits of their own property. This means that the inhabitants of the home can appreciate the countryside from wherever they find themselves in the home, whether it be on the first floor or ground level. Although the building has beautiful natural elements in its composition to represent its environment, such as the stone work on part of the ground floor walls, it is a thoroughly modern design, with alternating concrete volumes in a neutral grey. Now that we are well acquainted with the freedom the exterior of the home ensures, let us take a look at how things are on the inside of the home. 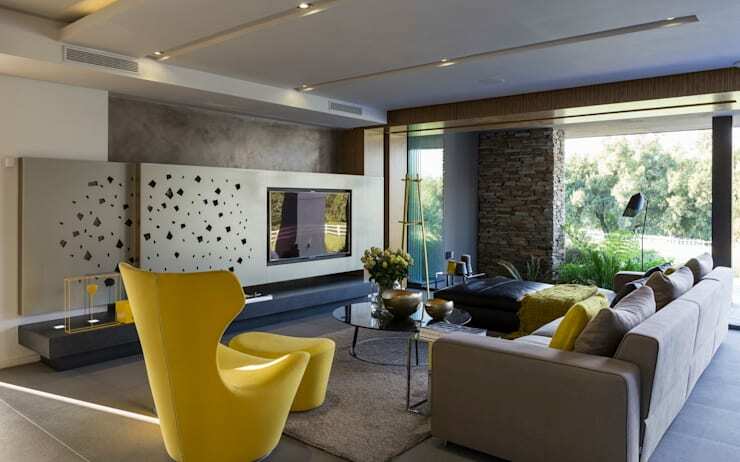 The home owners required a modern family home which is very spacious and uncluttered with superfluous decorative elements. Of course, they still wanted a sophisticated home that's made for living, so the designers had to carefully plan how to reconcile this sense of minimalism with a warm and comforting home. Here we see the living room of the house on the ground floor. First impressions reveal that the space is not complicated with too many features, and can be easily navigated visually. It is, however, also an aesthetically pleasing area, with splashes of bright colour and metallics to brighten up the atmosphere and give it a lively feeling. Here we have the master bedroom of the home. It is a clear and minimal space, but with some key features that make it a very romantic area. You can just see by first looks that it is a soft, dreamy space that is the perfect haven for a couple in such a large family home. The grey, concrete walls create a neutral background looks with an industrial twist, thus fusing the modern with the natural once again. this is complimented by the polished wooden floors on the natural side, and the grey colour scheme and use of steel for the industrial look. 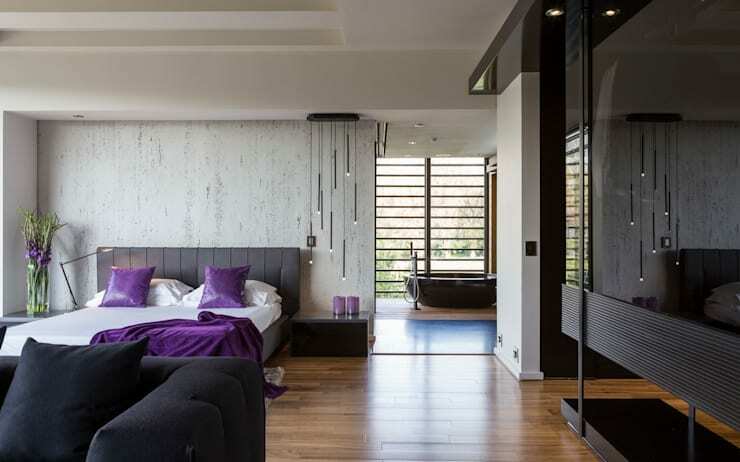 A rhythmic lighting feature graces the side of the bed, whilst a large, black free-standing tub can be seen in the bathroom area. These elements, together with the luxurious purple colour seen in the bedding, ensure that the romance is not lost in this room. 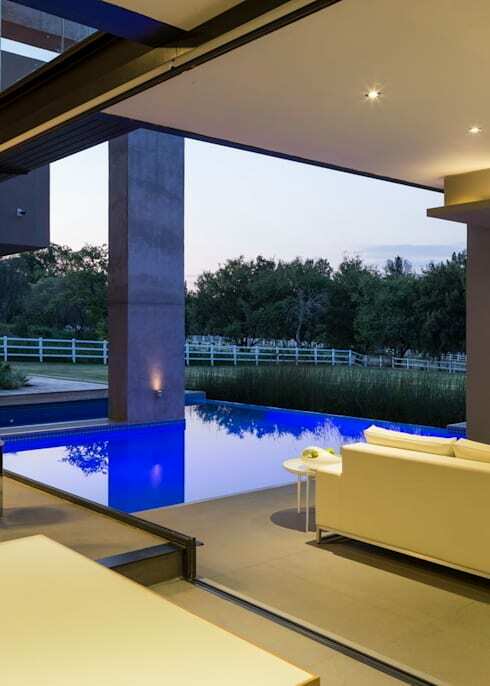 Lastly, we walk over to the porch and patio area of the home, nestled underneath a canopy which is still connected to the main building itself, and opens up onto the luxurious infinity pool. This lanai-style veranda space is characteristic of the homes designed by Meulen Architects, and ensures for an unparalleled indoor-outdoor connection to be enjoyed by inhabitants. As seen with some of their other lovely homes, comfortable furniture is situated right by the poolside, breaking down barriers between luxury and relaxation. What is particular to the House Blair Atholl, however, is the scenery that goes on beyond the pool and as far as the eye can see. Here, there are no fences to interrupt any views, and residents and guests are free to enjoy the stunning wildlife which the highveld is home to. Seems like the perfect home for an entire family! What did you think of the House in Blair Atholl? We'd love to hear your opinion!